KOBE (June 16) – Japan split their two-test series with Italy on Saturday as the Brave Blossoms lost 25-22 to the Azzurri at Noevir Stadium Kobe. Playing in front of a big crowd, Japan were starved of possession for much of the game as the Italians bounced back from last week’s defeat in Oita. The game started with a yellow card to Samuela Anise in the fourth minute. But some superb defense, particularly from Fumiaki Tanaka, saw Japan hold their own. The visitors, however were dominating possession and territory and they eventually opened the scoring in the 19th minute when a good counter-attack by Jayden Hayward was finished off by Tommaso Benvenuti in the corner. Tommaso Allan added the extras from the touchline to make it 7-0. The Azzurri used the more direct route for their second try seven minutes later when Leonardo Ghiraldini powered over from a succession of rucks close to the line. Yu Tamura, winning his 50th cap, closed the gap with a penalty in the 34th minute as the teams turned around with Italy leading 12-3. Four minutes into the second half, Jake Polledri stretched the Italian lead when his well-angled run split the defence. Japan needed an injection and it came in the 60h minute when William Tupou finished off some good work by his forwards. 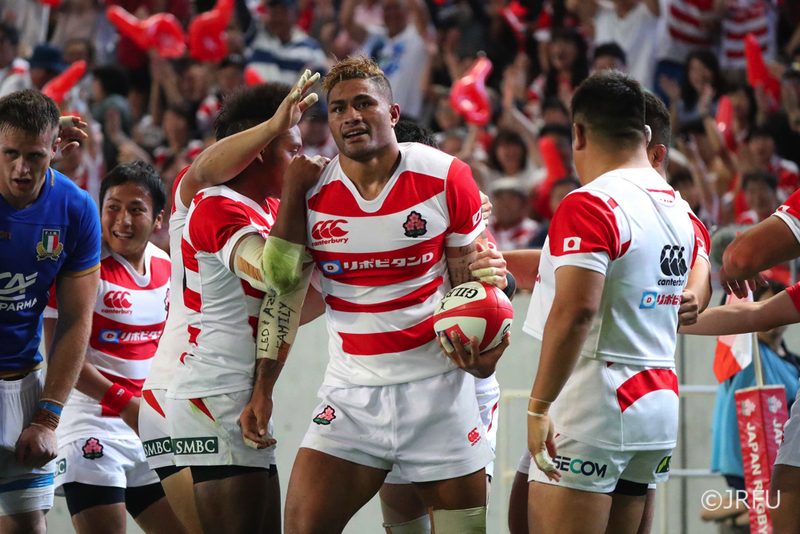 Rikiya Matsuda added the conversion to make it a 10-point game before he was again on target to add the extras to a try by Amanaki Lelei Mafi as Japan raised the pace of the game and finally put some phases together. The crowd sensed a victory, but their hopes were dashed as two penalties from Allan ensured Japan needed to score twice to win the game. Kotaro Matsushima managed one but time ran out to ensure the teams split the overall spoils.